At the start of this year, I gave a little mention to vkQuake2, a project which has updated the classic Quake 2 with various improvements including Vulkan support. Other improvements as part of vkQuake2 include support for higher resolution displays, it's DPI aware, HUD scales with resolution and so on. Initially, the project didn't support Linux which has now changed. Over the last few days they've committed a bunch of new code which fully enables 64bit Linux support with Vulkan. Screenshot of it running on Ubuntu 18.10. Seems to work quite well in my testing, although it has a few rough edges. During ALT+TAB, it decided to lock up both of my screens forcing me to drop to a TTY and manually kill it with fire. So just be warned on that, might happen to you. To build it and try it out, you will need the Vulkan SDK installed along with various other dependencies you can find on the GitHub. For the full experience, you do need a copy of the data files from Quake 2 which you can find easily on GOG. Otherwise, you can test it using the demo content included in the releases on GitHub. Copy the demo content over from the baseq2 directory. Oh boy looks like my Quake 2 Purchase was just right. Is this the one that also adds ray-tracing for nVidia's RTX cards? slaapliedje Is this the one that also adds ray-tracing for nVidia's RTX cards? No. After John Carmack left id Software and id Software bought by Zenimax/ Bethesda ; releasing open source engines to the wild has ended. Though that being said , id Software still have some John Carmack culture going on without violating Zenimax's rules/ approaches. 1-) They have gone with full Vulkan , just like they did before with OGL. 2-) Some id Software devs are just done Vulkan work on their free time , with games Quake 1 and Doom 3. Leopard No. After John Carmack left id Software and id Software bought by Zenimax/ Bethesda ; releasing open source engines to the wild has ended. Bethesda bought id Software in 2009, and Carmack left in 2013. Between these events id released the source code of Doom 3 BFG Edition and didn't release the source code of Rage. So, I'm not sure if it's up to Carmack or Bethesda to open sources. Anyway, Quake 4 is not an id Software game (it's by Raven Software), so they cannot do anything with it. I tried vkQuake2, it works, but has issues. No music, and weapons disappear if fov > 90. Actually, technically Quake 4 was open sourced. 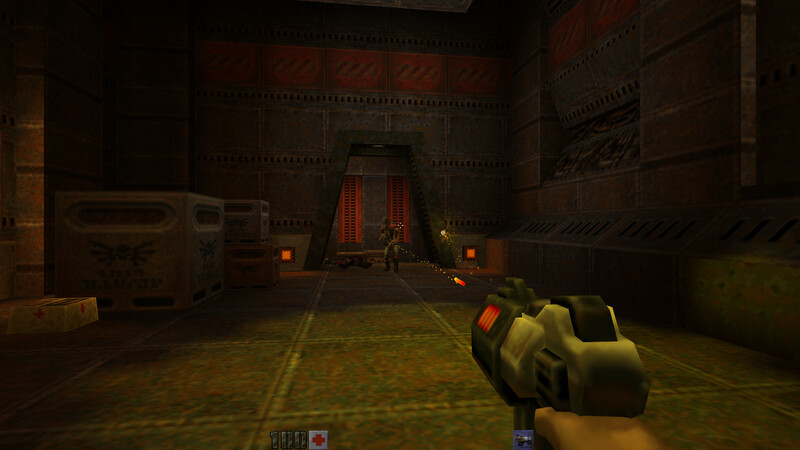 The thing is that it uses the same id Tech 4 engine, and id usually released source based on the engine itself more than per game, unless it has major changes like the BFG edition for id Tech 4 or Quake 1 and 2, which both use an engine kinda called "id Tech 2" but the former is much less developed and called the "Quake Engine," while the latter is known as the full-fat id Tech 2 most think of. No. Its engine is modified. It isn't just a total conversion of Doom 3. It had multi-core CPU support and other features Doom 3 had not. The same for Prey. You can't play Call of Duty or MoH: AA with ioq3, right? Probably it's possible to make Dhewm3 compatible with Quake 4, but don't think it would be easy. I read on Moddb or somewhere that there are many differences between two games, they handle scripts differently, etc. What about the version of id Tech 4 from the BFG version of Doom 3? That was also liberated and supports the features you mentioned about. Quake 4 wasn't like Jedi Knight II (another Q3/id Tech3-based game that can't use ioq3 unless if OpenJK or at least OJK's unique elements was merged with it) where it had a different animation engine or anything like that. It was basically plain jane id Tech 4 with some updates, that would also be in id Tech 4 for BFG. Also, id was assisting in its development, so Raven likely had to hold to the code standards of id Software itself. That should at the very least it make it pretty easy to port the assets over to BFG-ied id Tech 4.